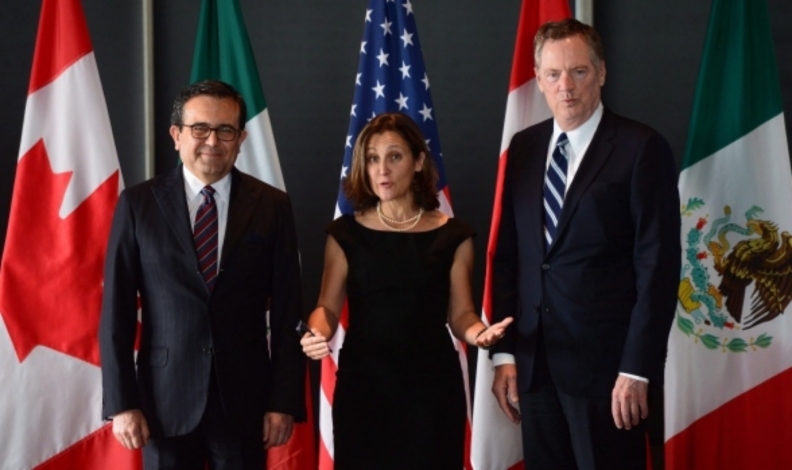 Minister of Foreign Affairs Chrystia Freeland, Mexico's Secretary of Economy Ildefonso Guajardo Villarreal, left, and Ambassador Robert E. Lighthizer, the United States Trade Representative, will attend a working lunch and hold meetings on Wednesday. WASHINGTON -- The NAFTA countries haven't broken up. But they are publicly bickering. They are delaying their next get-together date. And they appear to have agreed they won't be resolving their differences by the end of this year. NAFTA talks will be extended into 2018, and the next negotiating round is being pushed back three weeks in a tacit admission that negotiators aren't going to meet their original deadline for a deal by year-end. The latest round revealed enormous chasms in negotiating positions on everything from autos, dairy and Buy American rules to even the basic architecture of an agreement — and it was reflected in an awkward news conference Tuesday. "Frankly I am surprised and disappointed by the resistance to change from our negotiating partners," he said, with his Canadian and Mexican colleagues standing at his sides. "We have seen no indication that our partners are willing to make any changes that will result in a rebalancing." Canadian Foreign Affairs Minister Chrystia Freeland sounded a marginally more diplomatic note. She said it's actually a positive development that the countries have agreed to extend talks through the first quarter of 2018, allowing more time for preparation between rounds and for reaching a deal. Sources say the United States asked for the delay between rounds. They say the other countries gladly seized on that offer. One official said they interpreted it as a positive sign the Americans really want to work at negotiations, and want them to succeed. The countries had initially set an end-of-year target for completing a deal. That was based on the notion that the process would stall in 2018, and drag into 2019, because the political systems of Mexico and the United States will soon be seized by national elections. Still, Freeland appeared to blame the United States for a lack of progress. "Vice-President Mike Pence (said this summer) that he believed a win-win-win outcome would be achieved in these negotiations. Canada believes that too," she said. "But that cannot be achieved with a winner-take-all mindset or an approach that seeks to undermine NAFTA rather than modernize it. ... We've ... seen a series of unconventional proposals in critical areas of the negotiations that make our work much more challenging. "We have seen proposals that would turn back the clock on 23 years of predictability, openness and collaboration under NAFTA. In some cases these proposals run counter to WTO rules. This is troubling." Lighthizer stared at her when he later spoke, and said: "For us, they do matter." The Trump administration insists reversing the long-term imbalance of imports-versus-exports matters to U.S. prosperity, and although NAFTA partners represent only a small share of that imbalance, and even though Canada arguably doesn't contribute to it at all, Lighthizer said it's a change they must accept. The United States has surprised its neighbours by proposing things like a sunset clause that could end NAFTA in five years unless all three countries agree to extend it, and a near-total gutting of the agreement's enforcement mechanisms. This has made it explicitly clear the United States does not envision the easy negotiation other countries had hoped for, and which some Americans themselves had hinted at. That includes President Donald Trump, who recently said he only wanted minor "tweaking" to trade with Canada. Mexico's Economic Secretary Ildefonso Guajardo acknowledged the bargaining would be difficult. He said obstacles to progress remain and that all sides need to work towards constructive solutions. He urged countries to pursue a "win, win, win" — not a "lose, lose, lose." "We must understand that we all have limits," Guajardo said. "We must ensure the decisions we make today do not come back to haunt us tomorrow." Freeland says she's been preparing various scenarios since August 2016. While the business community is increasingly warning that the agreement may be in peril, she says she has been working on the possible outcomes for a while. "It's not new," she told a news conference at the Canadian embassy, after her frosty public appearance with her peers. "Hope for the best. And prepare for the worst."